People often look at horses in pastures and wonder why some horses have blankets and others do not. It’s a good question and hotly debated in equine circles. You will see some farms where none of the horses are blanketed. You’ll see others where they all are blanketed. Then there are others like Horses for Hope where some of our horses wear blankets and others do not. 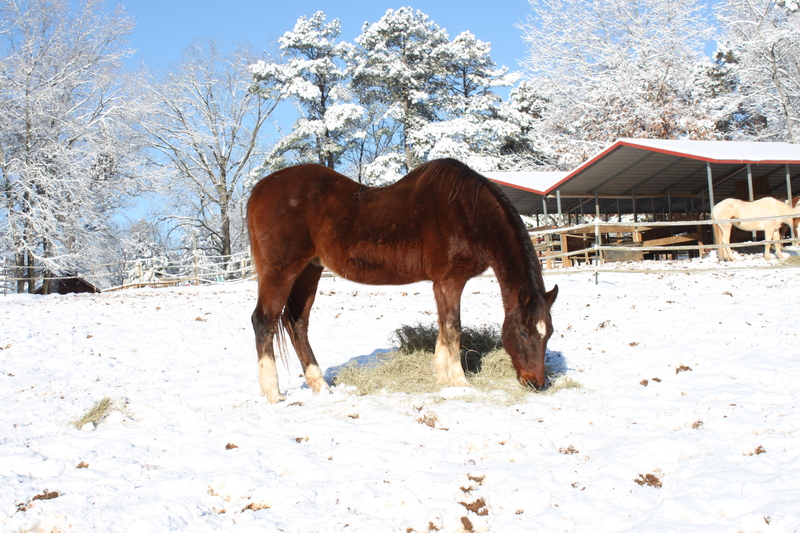 The first thing we do to help keep our horses warm is to feed them. A horse eats 1.5-2% of their body weight in forage (grass and hay) a day. That’s 15-20 pounds of hay for a 1000 pound horse. In addition to hay, horses get grain to provide them with vitamins, minerals, and, if needed, additional calories. The amount of grain is determined by the horse’s size, weight, if it is an easy or hard keeper, age, and the type of work it does. Our horses get their grain divided into two servings a day. Look at the pictures and you will notice that there are piles of hay all around. That’s because their grain isn’t the main fuel for their internal furnace, hay is! Then there are those amazing horse coats! Horses can move each hair on their body independently. When it’s hot they can slick their coat down against their body. When it’s cold they can stand each hair up creating a puffy blanket around themselves. Want to warm your hands up on a cold day? Slide them through a horse’s coat and feel the delicious warmth next to their skin. Other horses are thinner, have finer coats, health issues, or perhaps their hair is clipped and they need a blanket if they are turned out into a pasture. Sox is in the first picture. He just turned 32 on February 1st and is the oldest horse in our herd! Look closely at his picture and you can see how heavy his coat is. He doesn’t need a blanket! Valor is in the second picture. He has a very fine coat which means he has less natural insulation against the cold. He is also a thoroughbred, a breed which is typically thin-skinned and hard keepers. So, he wears his blanket to help keep warm. Here’s some more information about those amazing coats! Did you know a horse has 205 bones?